White 1-inch badge with a red heart and the words LOVE written in an iconic tattoo style font. This classic red love heart badge is perfect for any romantic occasion. It would be a fun handmade token of your love and look fab pinned to the front of your Valentine's Card or even used for keepsakes from your Wedding or Anniversary party. 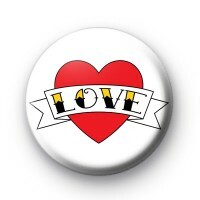 We have some really fun and pretty love themed badges in the shop so be sure to browse those too for lots more options.